Authentic Music is one of the big guns in British Christian music. Down the decades it has undergone name changes, buy-outs and important executive departures not to mention an ever-changing music catalogue that at some point in its history has released albums by just about every major figure in British and American Christian music. As with the ways of business connected to serving the needs of Christians, Authentic's history has been packed with twists and turns. Although Authentic Music, an offshoot of Authentic Media, didn't begin to operate under that name until 2002, its history goes back way, way before that. Back to the early 1950s, in fact. Authentic's earliest origins began when Scotsman Bill Hamilton began working for a Christian book publisher, Pickering Inglis. Identifying that just about no one was recording the church choirs and sacred soloists in Britain's churches he started Britain's first Christian label, Redemption Records, at first releasing the music emanating from the first Billy Graham Crusades in Britain in 1951. At the time of the Crusades, Bill met another Christian music entrepreneur, American Jarrell McCracken, who as a student at Baylor University had made a recording of a radio programme called Game Alive which likened the Christian life to a game of American football. It became so popular that some records were pressed up and Word Inc of Waco, Texas was born. Hamilton and McCracken hit it off and co-produced some recordings together. Throughout the '50s Word and Redemption continued operation but where Word had a huge potential marketplace with American churchgoers and grew steadily down the years, Redemption, with a much smaller quantity of UK churchgoers, struggled to keep going. 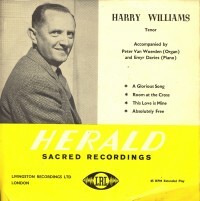 In 1960 Bill Hamilton, after working with Scotland's pioneering Livingston Recordings, moved to London and started the Herald record label, releasing a string of EPs and long players. But despite leasing some of Word's ever increasing catalogue of albums and occasionally recording a British artist or choir, Herald still found it difficult to survive and in 1967 they were part of a group that went into liquidation. But then Word picked up the pieces of that receivership and Word (UK) was born. Throughout the rest of the '60s and the '70s Word (UK), owned by its American parent, grew, particularly as the music started to change, gradually inching away from the George Beverly Shea, Frank Boggs and the Billy Graham Crusade Choir big sellers to take on board some of the contemporary styles kick-started by America's Jesus movement of the early '70s, with acts like singer/songwriter Nancy Honeytree and Barry McGuire. By the mid-'70s Word (UK) were releasing albums by British acts like The Alethians (with Dave Pope) and Nutshell as well as LPs by American artists like 2nd Chapter Of Acts, Andrae Crouch and Larry Norman leased from US companies like Sparrow, Light and Solid Rock Records. 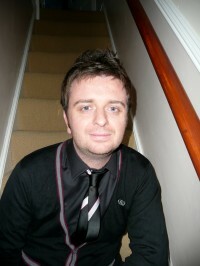 Bill Hamilton retired as managing director of Word (UK) passing the reins to his son Ian Hamilton. By the early '80s Word (UK) were the big fish in the small UK Christian music pond. UK acts like Bryn Haworth rubbed shoulders in the LP racks with the US best sellers from Evie, Amy Grant and Petra. By 1984 Word (UK) book publishing division was reformed and the following year TV's Rock Gospel Show catapulted Sheila Walsh to the status of CCM star. 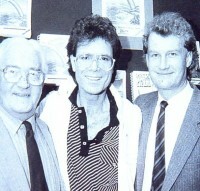 In 1986 Word (UK) moved to their Milton Keynes offices with Cliff Richard opening the complex. The following year the Word Record Club, by now a key part of Word (UK) sales strategy, was revamped with an advertorial "magazine," Premier. Also in 1987 a British act signed to Word briefly made the British pop charts but amid accusations of chart hyping the Sue Rinaldi-fronted Heartbeat never quite made it in the mainstream. 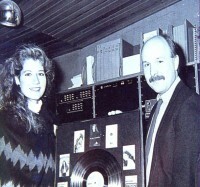 In 1988 Word (UK) began distribution of the quickly expanding praise and worship catalogue Integrity Music while a year later one of the most prestigious performances ever by a British CCM act took place when Adrian Snell performed his Alpha And Omega best seller at the Royal Albert Hall with a 700 voice choir. Not everything was a success for Word, of course. Their launch in 1990 of hard music mailorder offshoot Metal Direct quickly floundered but in the same year Word (UK) could announce that thanks to sublicensing arrangements with record companies around the world, over 50 per cent of Word (UK)'s sales were now overseas. In 1991 Word signed a licensing deal with CCM newcomer Warner Alliance (The Winans, Take 6) and Amy Grant's 'Heart In Motion' was a record breaking pop and CCM best seller. But corporate problems were ahead. The company that had risen from a one-man-and-a-secretary company during the Bill Hamilton era to a seemingly thriving international business with over 60 UK employees had stood firm when parent company Word Inc was sold to the secular media giant ABC who in turn passed on ownership to the spinoff ABC/Capcities. But then Word Inc, which had risen to become world's largest Christian record company, was bought for $72 million by Thomas Nelson, the world's biggest Bible publisher. Word (UK) were renamed Nelson Word. But in less than a year the company was stunned by the announcement that Ian Hamilton (managing director), Dave Withers (marketing director) and David Bruce (A&R director) were all leaving Nelson Word to form a new company and would be taking with them the American catalogues of Sparrow Records, Warner Alliance, Star Song and Brentwood Music. To lose all three of its top executives and the source of half its lucrative American repertoire was a shattering blow to Nelson Word. But they struggled on, appointed a new managing director, Graham Williams, formerly the founder and managing director of South Africa's Grace Music, and, as the year progressed, enjoyed healthy sales with Ron Kenoly's 'God Is Able' (from Integrity Music) and Amy Grant's 'House Of Love' (Amy coming to Britain to play UK gigs in the autumn). By 1995 the company was beginning to make up some ground again, picking up the catalogues of the new Gotee (Johnny Q Public, Christafari) and Rugged (Bride) US labels. But it still seemed, for a period at least, that Alliance had the strongest roster of US artists as well as establishing UK acts like The World Wide Message Tribe, while Kingsway Music were now firmly established as Britain's praise and worship market leader. In December 1996 there were more corporate convulsions in the USA when Thomas Nelson sold Word Records & Music for $110 million to multimedia company Gaylord Entertainment. So once again the UK arm were forced to change names. They became Word Entertainment Ltd. By 1977 the UK arm were enjoying some big sellers with albums like The Preacher's Wife soundtrack featuring Whitney Houston while the following year British acts like Maire Brennan and Eden's Bridge were coming through with strong Christian retail sales. By 1999 Word Entertainment were getting their biggest ever African American gospel sales with Kirk Franklin. In the summer of 2000 Word Entertainment's music director Jonathan Brown left the company to run Fierce!/Furious?, the company owned by the Littlehampton rock band who'd quickly become Britain's most popular Christian act, Delirious?. Shortly afterwards Carlisle-based Send The Light (STL), for many years the big player in the distribution of Christian books and music as well as the operator of the Wesley Owen network of Christian retail outlets, announced their intention of buying Word Entertainment Ltd. As it turned out, the label was allowed to keep its Milton Keynes HQ. And as 2000 drew to a close Word were enjoying good sales with Hillsong's 'Shout To The Lord' and a various artists sampler 'Fresh' (though that was going out at the bargain price of 99p). In 2001 Word Entertainment launched a new contemporary label, Focus, run by New Zealand-born Shelley Needham. 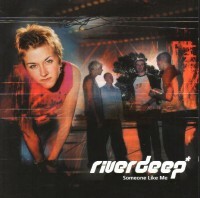 But after a high profile launch in Milton Keynes toting the first three releases from Britain's Riverdeep and Phatfish and Norway's Salvation Street, the label fizzled out and Shelley returned to New Zealand. It was still overseas repertoire from acts like Hillsong ('You Are My World') and Mary Mary ('Thankful') who were providing Word Entertainment with their big sellers. In January 2002 the company underwent yet another name change, Authentic Media. By the end of the year the new name company were enjoying Christian retail "hits" with Michael W Smith, Hillsong and the Heart Of Worship series of worship cover versions. But then another corporate realignment occurred when at the end of 2002 Send The Light (STL) bought Alliance Music, the company started by Ian Hamilton and which for a season had threatened to surpass Authentic's UK Christian market share but which had floundered when it lost much of its American catalogue when EMI Christian Music Group left Alliance and placed their catalogue in the hands of Kingsway Music. Executives David Bruce and David Withers completed the circle and returned to Milton Keynes, Bruce to run Alliance as a UK artist label of Authentic. The new alignment brought UK acts like thebandwithnoname and Nicki Rogers under the Authentic banner while CCM-into-worship acts like Phatfish and Michael W Smith were selling well as were the WoW compilations. But then in the summer of 2005 yet another body blow struck Authentic. One of the major sources of American Christian music, Provident-Integrity Distribution, with a vast catalogue of such acts as Michael W Smith, Third Day, Kirk Franklin, Maranatha! Music and Fred Hammond switched from Authentic to the UK arm of Integrity Music who up until that time had worked exclusively in the worship music field. Like a repeat of the Word (UK)/Alliance Music scenario of 1992, the company's US catalogue was decimated. In 2007 the veteran Word/Alliance/Authentic execs David Bruce and David Withers retired. The replacement for Withers, by then the MD for Authentic Media, surprised the Christian media world. In October the head of STL Keith Danby announced that the new managing director of Authentic Media was to be Gareth Russell, at 28 the youngest ever MD of a major Christian publishing house and music company. Through the long corporate tangle of Word/Authentic's history, the company's ability to bounce back from the loss of key personnel and major catalogues has been impressive. As I write this, I see that such products as Hillsong, the ACM Gospel Choir, the Ultimate Worship box set, 'Wow Hits 2009' and 'Hip Hope 2009' are all registering on UK Christian retail's best sellers chart. Clearly there is still much mileage left in the company initiated in such humble surroundings by Bill Hamilton all those decades ago. Recently I had a chance to interview Authentic Media's MD, Gareth Russell. Here is some of that interview. Tony: We are reading at the moment a huge amount about a crisis in the music industry with dramatically falling sales. How are Authentic currently finding the situation? Gareth: There is no doubt that we are currently experiencing very turbulent times. However, I think it is important to note that the industry is not dying, it is just changing. There is change at a macro level with the economy and the stability of financial institutions; there is change at a music industry level where the format of how people want to buy music and consume it is shifting towards downloads; there is change also within our subsection of the music industry, with consolidation and restructuring; and there is also change at the consumer level and what their tastes are and buying habits. At Authentic we have been asking some key strategic questions of ourselves and how we should best approach these changes. There is no doubt that sales have fallen significantly in the last 5 years, but I think it is important for us not just to sit back, but to look for new markets and new sales channels to help introduce our music to new consumers (and eventually fans!). Tony: What would you say to Christian retailers tempted to dramatically cut back on their stock of albums? Gareth: I can understand that when a retailer has a limited space they are most likely to cut the genres that are underperforming and stock up on those "quick wins" - especially in a recession. However, I also believe that retailers need to be planning on how best to impact the next generation of consumers looking for faith-based product. There is no doubt in my mind that the vast majority of 10-20 year olds are influenced more by the music they listen to (and the films they watch) than by the books they read. This is not to say we should not be encouraging that generation to read more, but we must also meet these consumers where they are at and if retailers were to cut back significantly on album stocks, I think they will find this to be a short term gain but in the long term would lose a key connection point with their next generation of consumers. I'm trying to find music recorded by Redemption in the 1950's of the Welsh Gospel Male Voice Choir. I know the label was taken over by Word but as the originals were released on 78's I'm finding it very hard to trace good copies. Rob, while I understand that there is some commercialism in Christian books and music, I also believe that God the Father loves anything that turns our focus from the idolatrist world that we live in and instead allows us to focus on him and his plan for us. I am not at all surprised at the saga I have just read. Christian?? Naa! my concern is with the lack of opportunity to perform and/or minister in the UK. Ten years ago it was bad, now it's almost non-existent. If you're not part of the resident band in a large church, or supported by a para-church organisation there are very limited places to play. Churches don't do music events on a local level like they used to. That's a real worry. I can't continue a music ministry on one booking a year, no matter how prestigeous it may be. No-one can. Without the opportunity to play every week, or better still three or four times a week, these bands (as good as they may potentially be) will never achieve the breakthrough they may deserve. On average a top US act plays 250-300 dates a year. In the uK it's more like 25-30. Reading the history of Redemption Records/Livingston Recordings/Word (UK)/Nelson Word/Word Entertainment/Authentic Music you've got to ask what God think of all this Christian Industry stuff. It's not the most inspiring representation of the Kingdom is it.